DeVoe is the complete solution for any Fashion or Entertainment site, with a focus on reducing bounce rates by providing endless content options. DeVoe also maximizes your ad revenue by providing countless ad placements, while increasing the visibility of those ads with sticky sidebars. DeVoe is also fully-responsive, retina-ready, translation-ready, comes with dynamic social sharing options, post/page slideshows, and much more! Responsive design – DeVoe adjusts its layout based on the device it is being viewed on. This means the theme’s content will be easy to read and easy to navigate whether it is being viewed on a desktop computer, a tablet, or a mobile device. Unlimited Ad Units – DeVoe takes full advantage of available ad space to give you a myriad of options to place your ads. The ad units include a main leaderboard area with adjustable height and width that can accommodate any size ad, a similar leaderboard ad unit displayed below each post, an Ad Widget that can accommodate 300px wide ads of any height in the sidebar as well as any size leaderboard ad in the homepage widget area. 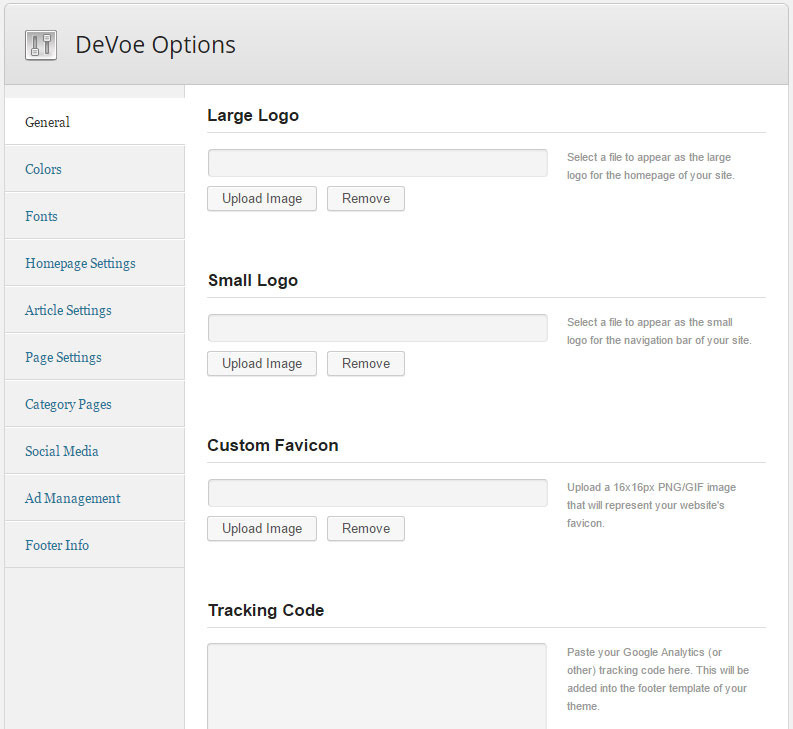 DeVoe also comes with dyanamic ad units within the homepage widgets that can accommodate 300px wide ads of any height. Drag-and-Drop Homepage – Create unlimited homepage layouts by dragging and dropping our custom widgets into the layout that gives your website the professional look and feel you are truly looking for. 8 Custom Widgets – DeVoe gives you the flexibility and ease of use to display your content the way you want it without altering any code with our custom widgets. MVP Themes takes pride in its support! If you have any questions related to the setup of DeVoe that are not covered by the theme documentation or if you run into any bugs with the theme, please submit a ticket at the MVP Themes Support Center. Unfortunately, MVP Themes cannot perform customization work for each of our customers, so DeVoe comes “as-is”. Any customization you would like to make to the theme outside of fixing bugs will need to be done by you or a third party. Increases speed of backend by removing dropdown of Google Fonts. Now, you can simply enter the font name in the Theme Options. Changes formatting of share counts higher than 1,000 to 1.0K, 1 million to 1.0M, etc.